I’ve heard these things countless times. Just some of the roles and responsibilities I carry are that of wife, mother, writer, pastor, pastor’s wife, friend, certified job coach, administrator, musician, songwriter, worship leader, and conference speaker…all at the same time. Did I mention I clean my own house too? Most people are juggling multiple roles and responsibilities, some more than others. What are the keys to handling multiple responsibilities at the same time, with excellence? Then one day a conference organizer called and asked if I would teach a workshop on time management. Evidently my reputation for getting things done well was more far-reaching than I realized. I couldn’t just get up in front of all those people and say that it was all God’s grace and send them home. The task in front of me was to track what I was doing and figure out how to teach others to do the same. I believe that an individual who learns successful time management can be compared to a church that experiences a lot of growth. When a church explodes with growth, people ask the leadership of that church how it happened. Some pastors will say, "We don't really know how this increase came about. We just prayed, and God moved." Sometimes people forget about the practical things they do that add up to a big difference. Perhaps they seem so basic, they appear insignificant. While I do believe those who experience church growth prayed, I also believe their prayers were active prayers accompanied by wise deeds. Perhaps they didn't realize it at the time. If they reconstruct their steps, they will identify some of the contributing factors to success. It’s the same for those who are good at juggling multiple tasks to accomplish everything they want to do. While thankful for God’s empowerment, there are also additional factors behind our effectiveness. It’s important to realize that nothing in your life ever changes until you change the things you do daily. Can a person really do it all? I’ve been asked this question many times. While I don’t believe any person is literally called to do it all, you are called to do all God has destined for you to do. I’ve also come to the conclusion that we may not do it all, but we can do more than we think we can. And certainly we can do what God planned for us. Two of the dictionary definitions of the word “exploits” are accomplishment or achievement. So in other words, the Bible tells us that the people who know their God shall accomplish or achieve. You were created with the potential to accomplish and achieve great things. The Bible gives another promise in John 14 of what is possible in the life of a person of faith. I take that to mean greater things. Literally. God wants to use us as an example to the world of what is possible in the life of one fully surrendered to Him, who has also put all of his or her time to good use. I have wrestled with this issue all my life. Since I was a young girl, I have wanted to accomplish a lot. Especially in my twenties, people scolded me to slow down. They said I had my whole life ahead of me to achieve things. The same people who were telling me to slow down and smell the roses also preached sermons about time being short and life being a vapor. The same people who said I had my whole life ahead of me preached about Jesus coming back at any moment. This was very confusing to me. I wrestled with this message and finally decided if God says exploits are His plan for me, and instructs me to be wise in order to maximize my time, I’m going to move forward in that direction. Each of us gets 24 hours a day. Each hour is divided into 60 minutes, which is 3,600 seconds. The difference is not in how much time each of us is given. The difference is what we choose to do with that time. There was only one time that God stopped the clock for a person. God held the sun still for Joshua. Hezekiah was the individual for whom God granted this request. Many times I have prayed for a Hezekiah anointing. It has never come. I must take charge of my time. Be careful in how we live. Be wise in how we live. Understand the Lord's will for us. With this in mind, I want to ask you an important question. What is your life really about? Some people believe that life is about getting basic things done. This might consist of things like cooking meals, doing laundry, going to work, paying the bills, and the like. True life is not about any of those things. Jesus talked about the Kingdom of God more than anything else in scripture. The Kingdom of God has nothing to do with whether we keep clean socks in the drawers. Please understand, I believe being a homemaker is a worthy choice. As I mentioned before, I clean my own house and do my own laundry as well. What I am saying is that getting chores done is not the purpose of my life or yours. Are chores a necessity of life? Yes. Are they why you were put on earth? No. God didn’t put anyone on earth just to make sure there were clean socks in dresser drawers. The number one reason God created you was to have fellowship with Him. This is true of all people. God has a purpose for the gifts He has given you too. The purpose of your life, in addition to your personal relationship with God, is to make a difference in the lives of others for eternity, starting in your home and emanating from it. So, for example, if you are a homemaker, your life is not really about socks or vacuuming, but investing in the lives of those for whom you wash socks or vacuum. Now I’d like to ask you another question. My husband and I have pastored churches for 25 years. One thing I’ve realized over these many years working with people in the church is that the majority of them live aimlessly. Most people have no game plan for their day. They wake up and live spontaneously, figuring out what they are going to do in the moment, with no real agenda in mind. Then they wonder why there is so much confusion and lack of productivity in their lives. Having an aim is important. What things are important in establishing your aim? In the remainder of this book, I’m going to share 10 principles I’ve learned that make it possible for me to juggle time well to meet my aims. Don’t worry. This information is designed to free you, not overwhelm you. 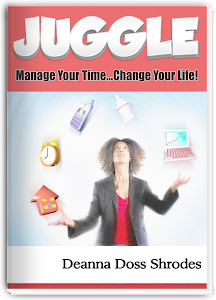 This may be the most user-friendly book on time management that you’ve ever read! I’ve purposely planned it that way. Telemarketers have called my office and tried to get me to register for 3-day conferences on Time Management. I’ve received direct mail campaigns that encourage me to sign up for a series of webinars that promised to save me time. I’m convinced it’s not that complex. You can learn to manage your time better without sitting through a whole day or weekend of meetings. In fact, I believe you can learn to successfully juggle your weekly responsibilities and accomplish some of the greater goals you have in the 10 easy-to- understand steps I’m about to share with you. This isn’t a flash-in-the-pan theory. I’ve successfully juggled my daily responsibilities for 25 years reaching many bigger goals I set for myself at the same time. I use a whole lot of common sense and absolutely no rocket science. The following are my tested wisdom keys that will change your life if you just apply them. We all long to spend time doing what we want to do. I find for most people this means two things: spending time with those we love, and doing the things we are passionate about. What would it be like to have more time than just weekends to do something you really want to do? What would it be like to actually have some time each day to do what you want to do? I have a passion to help people’s want-to's become reality. Like many of you I've been at a place in my life where the have-to's seemed so overwhelming, they threatened to suffocate my want-to’s. During many seasons of my career, I've covered additional responsibilities during transitions. Through it all, I still had time for my want-to’s. What, besides the grace of of God, has made this possible? Following the principles of Juggle. Without them, my want-to’s would have been impossible. I wasn’t born with a kind of superhuman energy that some people mistakenly believe I possess. Actually, an important fact I want to share up front is that I live with a physical condition that affects my energy level. I could use my medical diagnosis as an excuse, but I don’t. Why am I sharing this information? To help you understand that this process will work for anyone! Not only do I not have superhuman energy, I actually live with challenges in this regard. Even with that, the principles I am about to share have worked for me for 25 years. They can work for you too.